Hanoi - Amsterdam high school for the gifted' s opening ceremony on the new campus was held during the 1000-year celebration of Thang Long – Ha Noi and it was a major event to all students, teachers, parents and millions of those who love Hanoi – Amsterdam high school. The new huge campus of the school has been fully equipped with advanced, modern and standardized infrastructures and teaching equipments which make all of us feel proud to be part of a thousand-year old capital. The new campus is considered an important educational institution, playing a critical role in educating talents for the country. Also, in the event of celebrating 1000-year Thang Long – Hanoi, the campus is itself a gift, from the People's Council, the People’s Committee as well as all Hanoi's citizens to Hanoi' s education in general and Hanoi – Amsterdam high school in particular. The school where dreams take flight: being one of the top high schools for gifted students in Vietnam, our mission is to discover intelligent students, provide them with a solid foundation of knowledge, acquaint them with innovative and effective study techniques, and kindle the fire inside each of these youths so that they will grow into citizens with true talents who can serve the nation in this period of industrialisation, modernisation and globalisation. The school that develops and perfects individual personality: we always provide the best environment for students to gain life skills and independency, immerse with community life. Here, students can develop talent, creativity, the respect for societal rules but also the confidence needed in all aspects of life. These are the crucial premises for students to become citizens who can assist the country. The school of innovation with a global view: we put priority in an open development, on one hand respecting the criteria of high schools, and on another hand, use all of our abilities to create the most advanced educational approach that focus all attention on the students and turn education into self-education, which is always updated with the latest advances in technology. The school also pays attention to foreign relationships with cultural exchanges and friendship programs with others both nationally and internationally to share experience and design educational models especially intended for gifted students. Hanoi Amsterdam High School wishes to build an image of a reputable high school in the region that is extending its arms to reach the rest of the world. Looking back on the past 25 years, the school is proud of all the achievements it has attained in the process of educating scholars for the country. However, it is necessary to understand that, while establishing pride is hard, sustaining it is even harder. Stepping into a new period of development, the school has realised its enormous responsibility as the People’s Committee, the People’s government board of Hanoi and the ministry along with people from around the city and country have placed their trust on it. 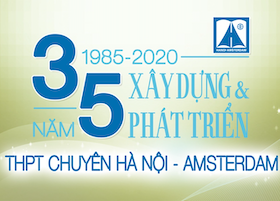 More than ever, each member of the school board, each student that is currently studying in the school and also alumni from all over the world, should exert themselves to the utmost to turn Hanoi Amsterdam High School for the Gifted into one of the top schools of modern education, contributing to the development of a prosperous, civilised and happy Viet Nam.